"Saltydog" redirects here. For other uses, see Salty dog. Swagger is the debut studio album by the Celtic punk band Flogging Molly, mixed by Steve Albini. It was released in 2000. In a very positive review, Allmusic called "Swagger" a combination of the "folk of the Pogues with an Oi! blast by way of the Dropkick Murphys." The reviewer went on to call the album "music that's perfect for any barroom brawl." Punknews.org gave the album 5 out of 5 stars and said that "every song is a keeper, without a clunker in the bunch." The album also called "Salty Dog" the "quintessential Flogging Molly song" and noted the album's contrast between aggressive punk-influenced songs and slower ballads like "The Worst Day Since Yesterday." "The Worst Day Since Yesterday" was used as the music for the opening and closing montage in Stargate: Universe season 1, episode 9, "Life" (first broadcast November 20, 2009). "The Worst Day Since Yesterday" was heard in the background in the bar scene in Mr. and Mrs. Smith. "Selfish Man" was used during the closing scene, and over the closing credits, of the fourth episode of Showtime's Brotherhood. "The Ol' Beggars Bush" was playing the bar when Dean picked up Rory in the fourth-season episode "Last Week Fights, This Week Tights" of Gilmore Girls. "Devil's Dance Floor" was used in Derry Girls, episode 5 of series 1. All lyrics written by Dave King, all musics composed by Flogging Molly, except where noted. 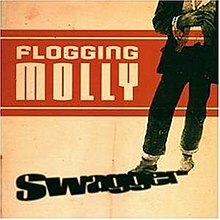 ^ "Flogging Molly - Swagger". Punknews.org. Retrieved 2012-03-11. This page was last edited on 28 October 2018, at 16:36 (UTC).